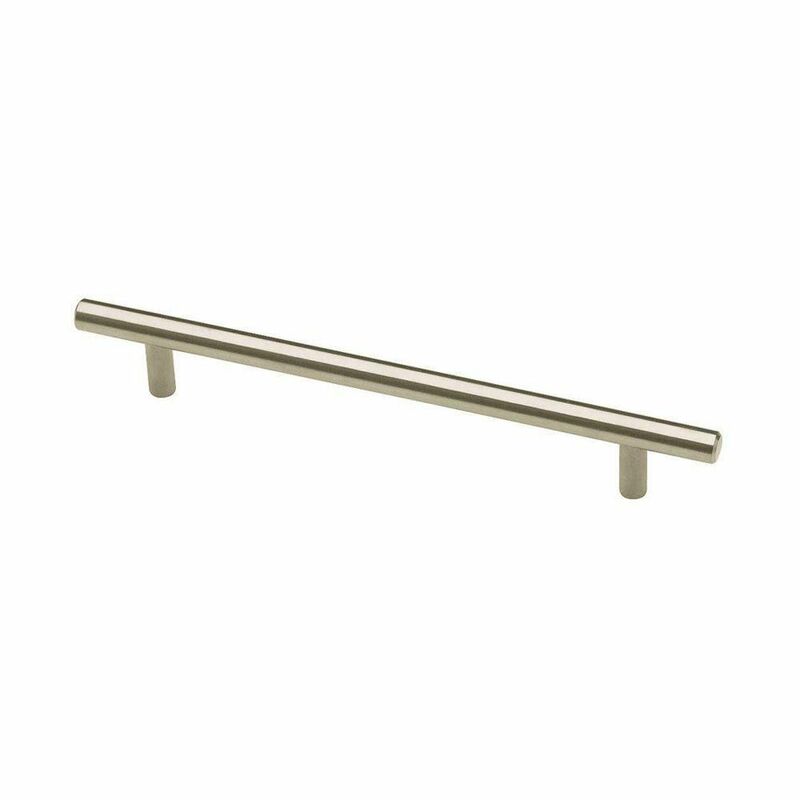 The Steel Bar Pull exemplifies sleek, contemporary European styling with crisp, clean lines that will upgrade the look of any room in your home. Perfect for modern cabinetry and furniture, crafted from steel for long lasting quality and durability. For your convenience, installation hardware is included that fits many cabinet applications. 128/188mm c-c Steel Bar Pull The Liberty 5 in. Stainless Steel Appliance Bar Pull offers a contemporary European look to your cabinetry. This pull blends well with many different decorating schemes and is designed for use with 5 in. center-to-center measurements. Designed for easy installation. 128/188mm c-c Steel Bar Pull is rated 4.7 out of 5 by 10. Rated 5 out of 5 by Danielle from Beautiful, sturdy hardware that looks great in our kitchen with... Beautiful, sturdy hardware that looks great in our kitchen with stainless steel appliances. Highly recommend. Rated 5 out of 5 by Misty from I had my kitchen cabinets refinished and these handles were easy to install and give my kitchen a... I had my kitchen cabinets refinished and these handles were easy to install and give my kitchen a nice modern look. Rated 4 out of 5 by Peter from Beautiful item, easy to install. Made my cabinets look amazing.... Beautiful item, easy to install. Made my cabinets look amazing. Rated 5 out of 5 by Christine from These cabinet pulls are really pretty and substantial. Definitely would... These cabinet pulls are really pretty and substantial. Definitely would recommend. Rated 5 out of 5 by Sharon from Beautiful and great quality and very sturdy. And a great... Beautiful and great quality and very sturdy. And a great price too! Rated 5 out of 5 by Mike from Very pleased. Great price. These are nice and heavy. They come with two different length screws o... Very pleased. Great price. These are nice and heavy. They come with two different length screws one for doors and one for drawers.